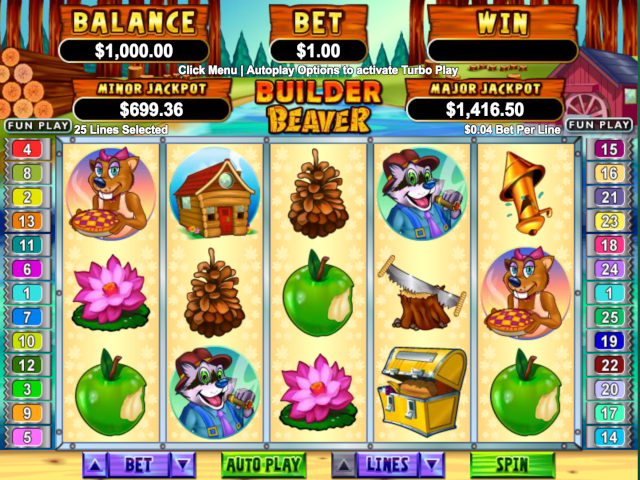 It’s time to get to work with Bob the Beaver building dams and handing out both minor and major progressive jackpots! The Builder Beaver free slot is part of the progressive jackpot range but unlike other games in this chain, it is also available in free play. Builder Beaver is 5 reel, 25 payline free slot with 2 bonus features including Beaver and Sign Feature. There are 9 game symbols including the substituting wild Beaver and the scatter sign symbol. As there are 2 features within this game, both the wild and the scatter symbols unlock a feature each when 3 or more of the symbols are awarded. The sign feature awards 10 free spins and is triggered when 3 or more of the scatter sign symbols appear across the reels. During these free games, all prizes are doubled, all signs act as additional Beaver substitutes and free games are played at the lines and bet of the triggering game. The Sign symbols will change into Beaver substitues before line pays but after scatter pays are awarded. 10 additional free games are awarded whenever 3 or more scatter signs or 3 or more scatter Beavers appear anywhere during sign free games, before signs morph into Beaver substitutes. The Beaver feature awards 12 free spins and is triggered when 3 or more scattered Beavers appear on any of the reels during standard play. Prizes in Beaver free spins are tripled when one or more Beavers substitute in a winning combination. The Beaver feature can be re-triggered and during these games, no Sign symbols will appear. The Builder Beaver progressive jackpots can be won at the end of any standard play and is triggered at random. The wins from progressive jackpots are added to other wins obtained during play. Random Jackpot contribution is no more than 1.5% of total return to player.